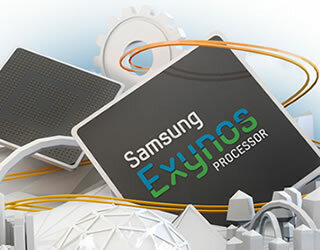 The Exynos 5 Dual uses two ARM Cortex A15 CPUs alongside a Mali T-604 graphics processing unit – the same one that was recently submitted for OpenCL 1.1 full profile conformance through Khronos. As we noted in the OpenCL article, the T-604 is able to offer up to five times better performance compared to previous versions of the GPU thanks in part to its multi-core configuration, tri-pipe architecture and better memory bandwidth management. We also understand that there will be built-in USB 3.0 and SATA III controller support, both of which could equate to high-speed data transfers to and from your computer. Furthermore, there’s an embedded Display Port interface and support for 1080p video recording and playback at 60fps and even 3D Stereoscopic support. Needless to say, this SoC is shaping up to be extremely impressive but unfortunately it’s still too soon to know which product will be the first to ship with it. If you’re into rumors, Android Authority has it on good word that we could see the chip debut inside the Galaxy Tab 11.6 later this year. The company reportedly had to wait for this new chip in order to support the WQXGA (2,560 x 1,600) resolution display.